Many Veterans turned out for Flag raising Ceremony! The dedication part of this ceremony, was to dedicate the newly completed Cullen Park “Entrance Way” project that we took on a month ago. 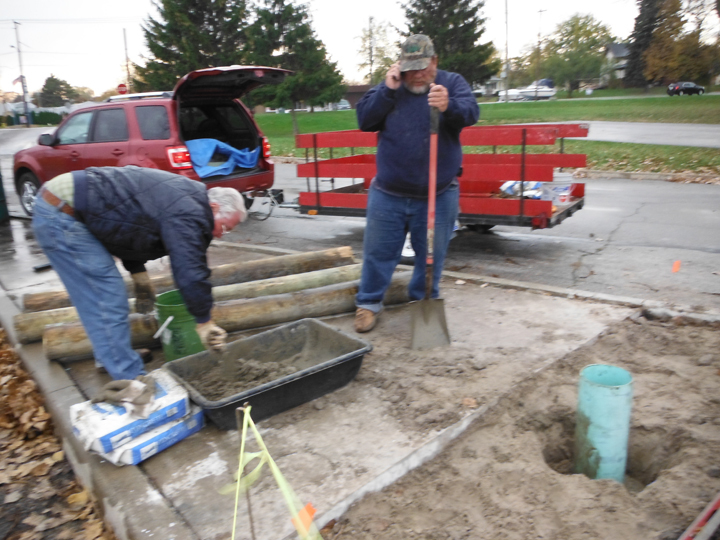 We worked with the City of Toledo Parks Division, to remove the no longer needed toll booth on august 31st., then beginning October 25th and complete on November 1st with the installation of the flag pole, all by Volunteers and donations. More information in post below. 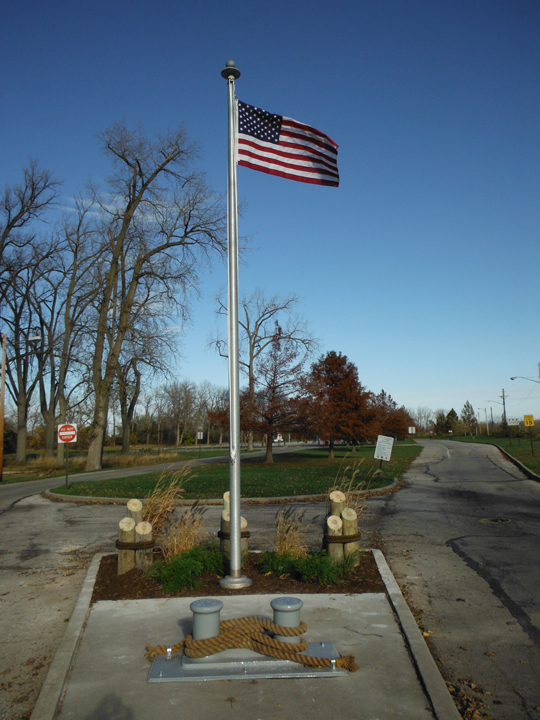 On Veteran’s Day- Sunday, November 11th, a ceremony will be held at 2:00 pm at the entrance to Cullen Park, to dedicate the new flag and to honor Veterans. 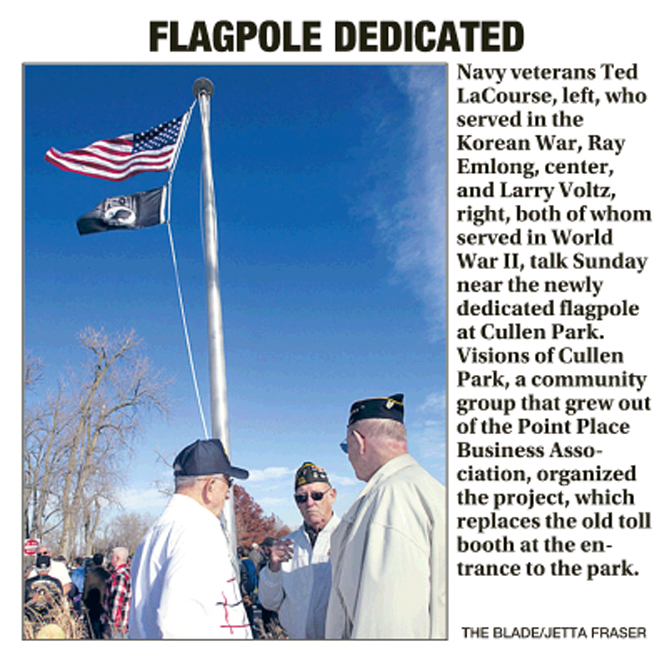 The flag pole had been donated by Howard Pinkley a Veteran, to the Visions of Cullen Park group and the flag was donated by Howard’s daughter, Wendy. 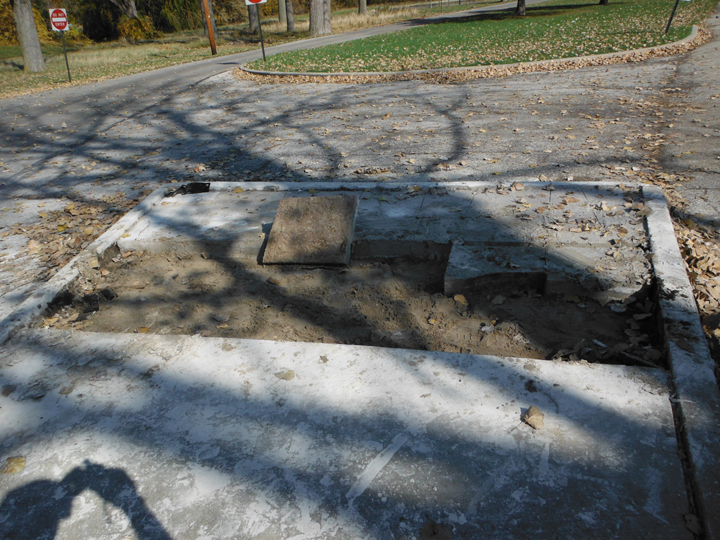 They have been placed at the entrance of the park where the former toll booth stood. The area was improved with plantings and nautical post with ropes, the bollards were donated by Ken Socie. 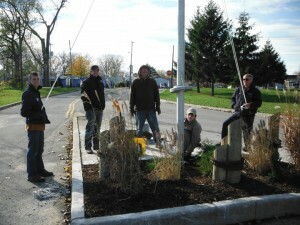 This was totally a volunteer project by the members of Visions of Cullen Park and local Point Place/Shoreland community residents. Veterans are invited to attend along with the public who are encouraged to seek out veterans who may need a ride or assistance to attend. The monthly meeting will include discussion of the ” Entrance Way Project”, also discussion on future projects and suggestions. Meeting starts at 6:30 pm, at the CrossPoint Community Church, and usually last for 1 to 1 1/2 hours, depending on the subject that is up for discussion. Entrance Way Project is Finished! We complete the revitalization of the entrance “Island” or formerly known as the toll booth stop and pay place on Thursday, with the installation of the flag pole !! 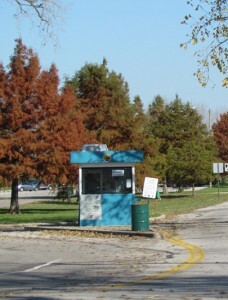 The Entrance Way Project started back in august, by the City of Toledo removing the old and deteriorating blue toll booth. We then proceeded with a committee to come up with a design for that flat and barren concrete slab. 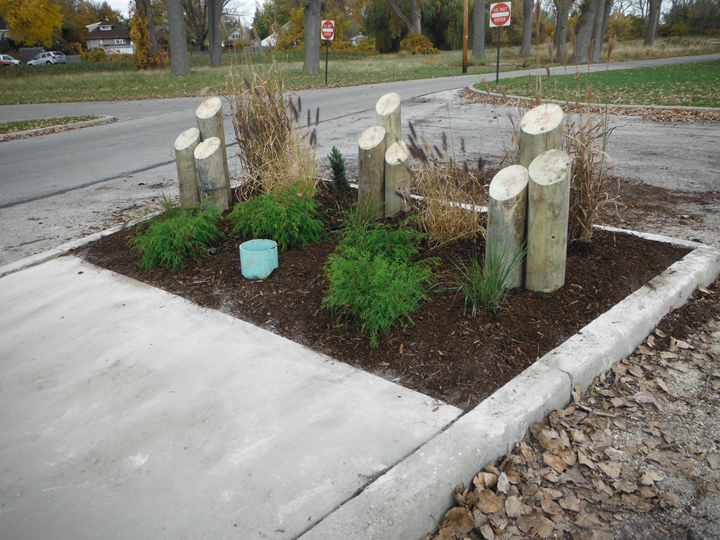 We then brought the design to the attendees at the September and October Visions of Cullen Park meetings. Approval of funds to be taken from our “Kroger funds” for the project, plus a few anonymous Point Place/Shoreland concerned citizens, have stepped forward with money to complete this project- thank you! The flag pole had been donated by Howard Pinkley back in June. 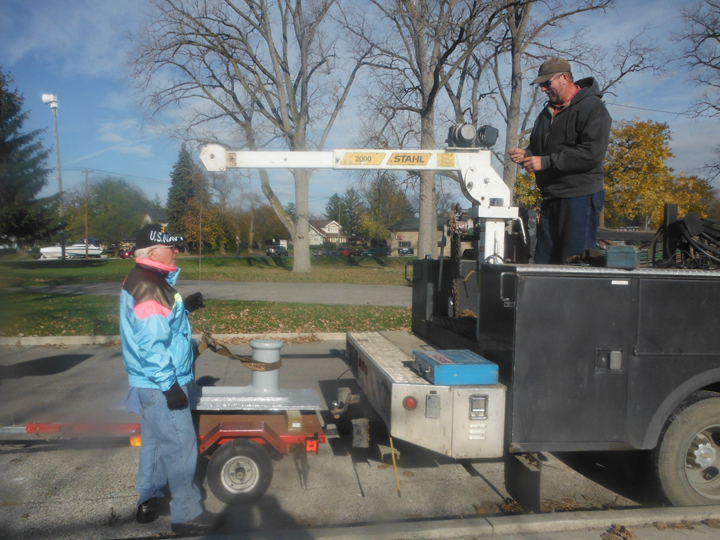 We started Thursday morning (Oct. 25th), by renting a walk behind concrete saw at Home Depot. 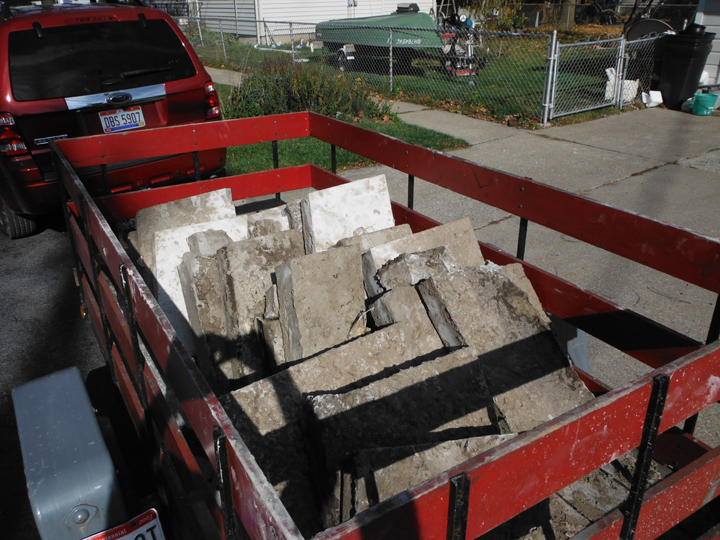 Volunteers Dave Zobler, Len Syreck and Bob Pulhuj, spent a long day cutting and loading 2 trailer loads, equaling about 2 tons of concrete, transporting it to a legal disposal site. Friday was another rental day, a trailer type post hole auger from Home Depot, to drill four 12″ diameter holes 42″ deep, for the 3 wood “dolphins” and a flag pole sleeve. There were a couple of surprises, first was the all the sand and then “black gold” only 24″ down! Well the black gold quickly turned into black asphalt, the old original driveway to the park that was covered up when the park area raise to eliminate flooding back in the 1980’s. 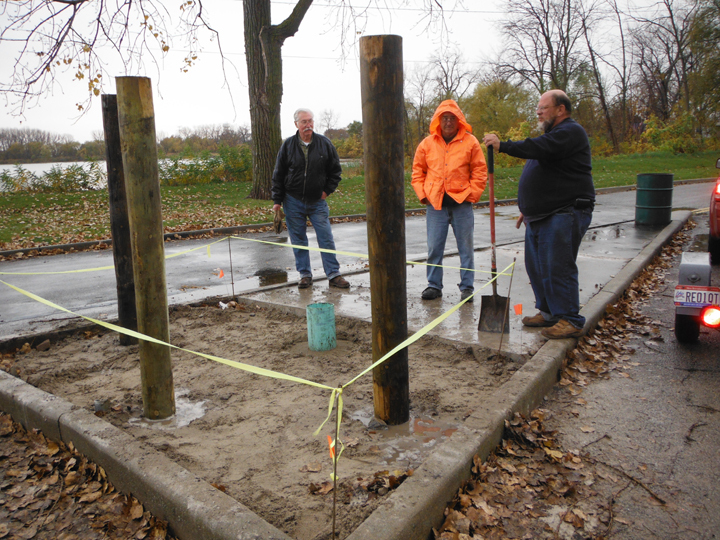 Again the volunteers, Gene Kidd, Lance, Hue, Dave Zobler and Bob Pulhuj worked through the Friday afternoon rain, mixing bags of cement for the flag pole and getting the wood post buried, so that the rain would wash the sand in around the post. Lance, Dave Zobler and Gene Kidd in the rain! Saturday the 3 dolphins were finished and the plantings were put in place, along with a truck load of mulch was dropped off for us to rake in, donated by Jim Turski, of Point Place Lawn Care, that put the “icing on the cake”, if you will, that made the area looked terrific, as if it had been there for years!! 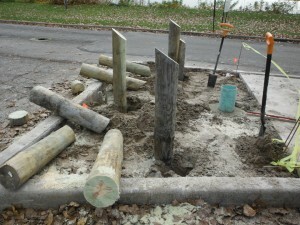 8″ post are cut at angle! Sunday morning the totally restored Bollard which was donated and installed by Ken Socie, along with the help of John Rudolph, Don Stader, Bob Pulhuj and Vee Stader. 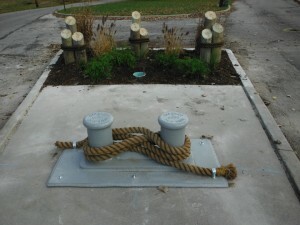 Rope was added to the dolphins and wrapped around the bollard show how it was used to tie ships to docks. Thursday the flag pole was installed with the help of volunteers. It started by going to Howard Pinkley’s house and removing the flag pole out of the ground, that he had graciously donated. Then there was the short trip down 131st and Summit street to Cullen Park, just over a mile. 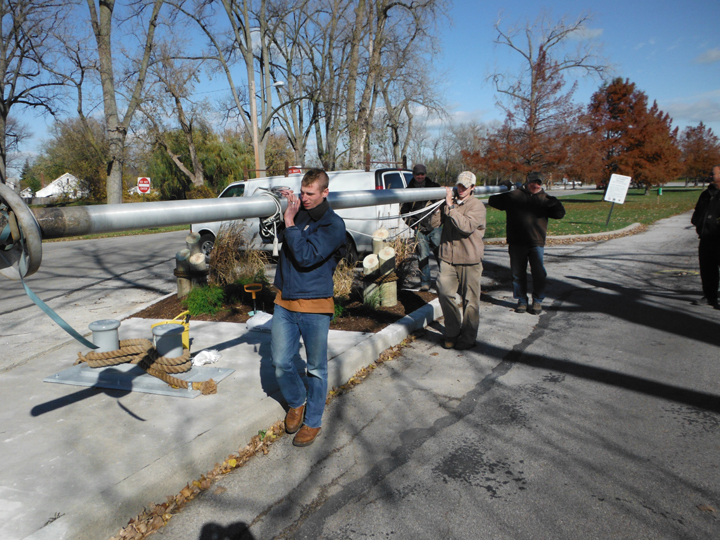 The volunteers installed new ropes and a battery powered solar light at the top, then in a matter of minutes the pole was uprighted and slid into the sleeve. The strong continuous winds out of the Southwest Sunday and Monday made for an unusual sight Monday morning. 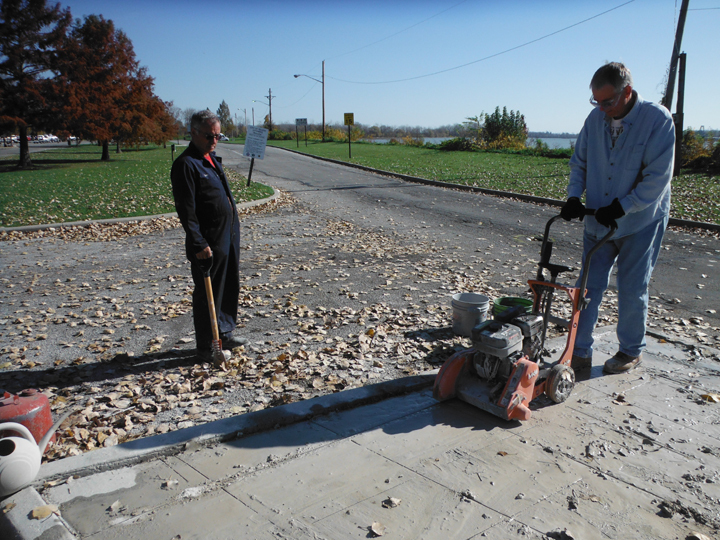 The wind caused the water to leave the western end of Lake Erie, leaving only a mud bottom in the bay at Cullen Park, except for that newly dredged 80’ wide boating channel. There was still 3 feet of water in the channel for boaters and duck hunters to launch from Cullen Park to make their way to the shipping channel possible. Picture was taken from the canoe/kayak dock, with Bay Shore Power Plant in back ground. The monthly meeting will include an update of the ” Entrance Way Project”, also discussion on future projects and suggestions. Don’t forget Wednesday Sept. 26th- 6:30 at the CrossPoint Community church. Discussing the Toll Booth project status and up date on a few of the other concerns that people have expressed! Yep that’s the date for the next meeting! Yes, it’s not the “normal” fourth Wednesday of the month, but due to committee scheduling conflicts, it will be on the fifth Wednesday, same location! The Design proposal for the area of the Toll booth near the entrance to the park will be discussed. The booth is scheduled to be removed in the next few weeks, so if you have some ideas, please come to the meeting and let’s talk about it! The September meeting will back on the fourth Wednesday – September 26th, hope to see you there! We’re back to the fourth Wednesday for July’s meeting, but August will be the fifth Wednesday August 29th! Then September will be back on the fourth Wednesday for the winter months! Toledo Chief of Police Derrick Diggs being the guest speaker, along with discussion on our next project! Please go to “meeting information” page for location and time! 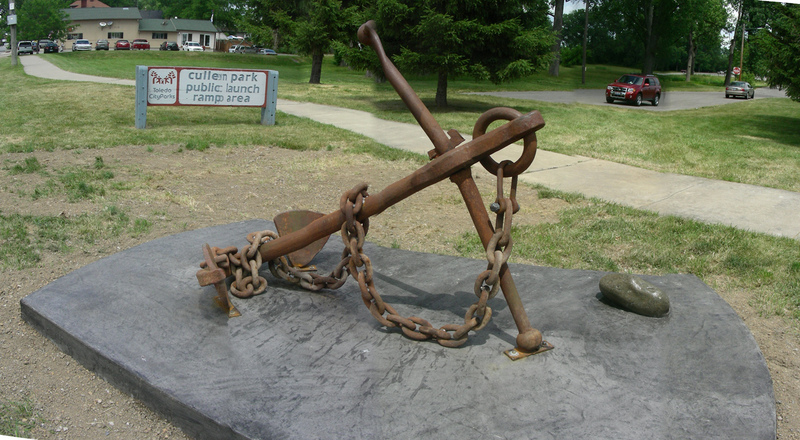 June 30th, at 11 am, at Cullen Park, the new anchor monument, will be dedicated in memory of Fritz and Em Socie, long time Point Place residents. This anchor sets right at the entrance of the park, near summit street, giving the sense that this park and Point Place are a nautical community. 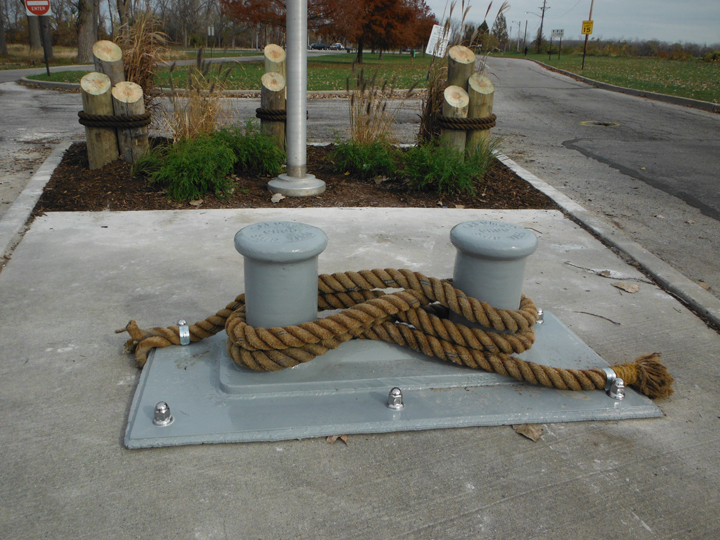 The anchor was donated by their son, Ken Socie, also a life long Point Place resident. 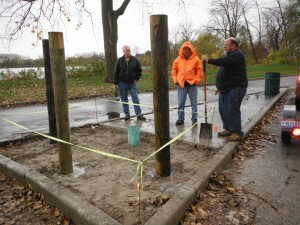 This project was supported by the Visions of Cullen Park, with the great cooperation of the City of Toledo Parks. 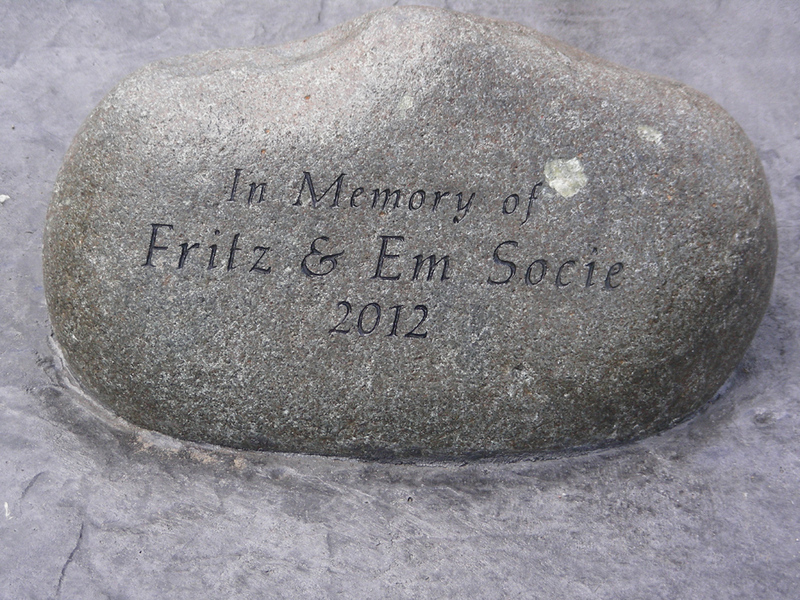 There is an engraved stone at the corner of the base nearest the sidewalk, for all passerby to read the inscription- “In memory of Fritz and EM Socie 2012”. In attendance will be Denny Garvin – Commissioner of Parks, Lindsay Webb – Point Place’s Councilwoman, along with Ken Socie and the entire Socie “clan” and other “dignitaries”! All are welcome to attend this greatest historic event of Cullen Park in recent times!